Saddle Up and Follow Your Dreams! Thank You! You will be emailed a camp packet soon! 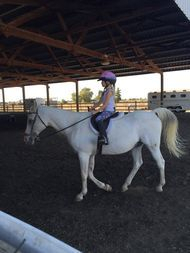 Our week-long day camp is a safe way for children to learn everything about horses, play games and make new friends during their time off from school, all while learning responsibility and building self-confidence. We have experienced, upbeat instructors and lovable, well-mannered horses for your children to gain basic and intermediate horsemanship skills. 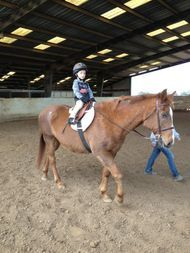 This program is more than learning how to ride a horse. 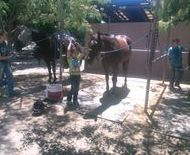 Emphasis is placed on horsemanship skills that develop riders into safe, responsible, and educated equine enthusiasts. We strive to create riders that understand equine instinct and behaviors -- a skill that will allow them to become excellent communicators with their mounts, even as a beginner. Our aim is to create enhanced self esteem in our riders, and value teamwork and good sportsmanship. 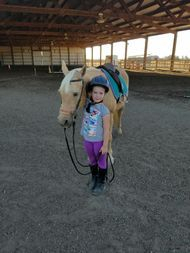 We have boots and riding pants that the campers are welcome to use. We will be having 3 camp sessions this year.